Communicators working at charities spread across multiple sites will be all too familiar with the sense of ‘them and us’ that can divide central office from branches, groups or regions. And most will recognise that sinking feeling of half the time being told you’re bombarding people with information, while spending the rest of your day dealing with disgruntled colleagues who claim you never tell them what’s going on. There’s a unique set of challenges in delivering consistent, effective and engaging comms across an organisation spread across multiple locations. 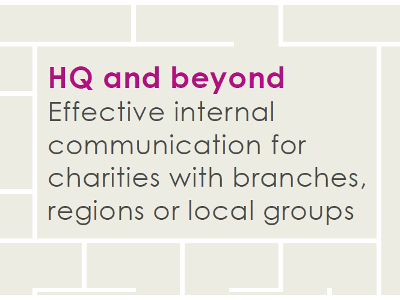 Some of these issues are common to all organisations, whether commercial or not-for profit, dispersed or single-location – but our guide is written for charity comms people who wish to develop effective communications throughout multiple localities and groups.